Like most First World information omnivores alive today, I consume a lot of news. It was not always so. On the farm where I grew up the arrival of our town’s weekly newspaper in the Thursday mail was a big event. But then I went off to college, began my career working for the Topeka Capital-Journal, dove into researching and proposing stories for National Geographic and thus, gradually but inexorably, built my life around consuming — and producing — the news. Now my iPad is tracking how much screen time I average every day. It’s a lot. So, yes, it is my habit to keep up with the news. 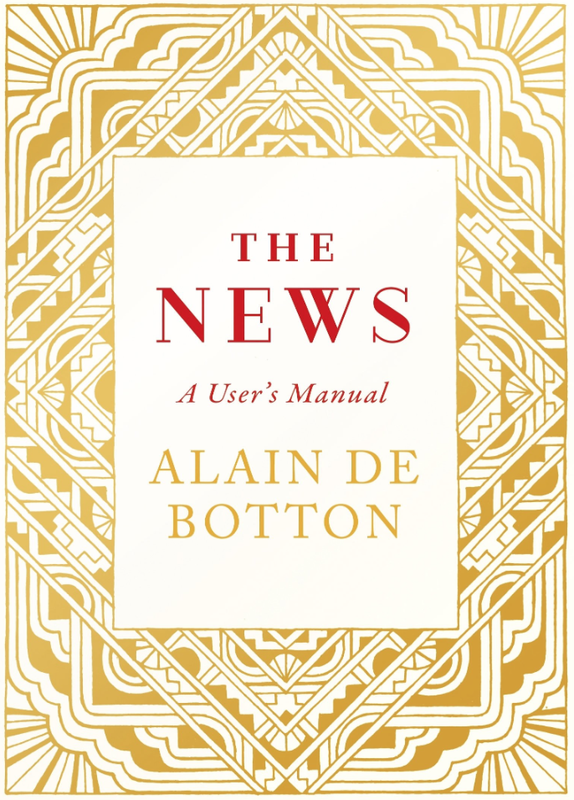 Alain de Botton’s book The News: A user’s Manual makes me wonder if my habit isn’t really an addiction. And not a very healthy one at that. With our always connected iPhones (and their “smartphone” cousins) news follows us everywhere, the incessant beeps, notifications and bulletins calling out to us, seductive and irresistible. News as an addiction and not a duty of citizenship? What kind of heresy is that? Isn’t news, by definition, good for you? That’s what I tell myself, thus justifying every peek I sneak on my iPhone, sure in the knowledge nothing is more sacred in our news-saturated culture than staying up to date. De Botton thinks otherwise. The News: A User’s Manual contains many ideas that are otherwise. (De Botton is a fine contrarian.) He is more than just contrary, he is also insightful about something fundamental to how we see the world, and like with Eyes On Earth, someone who we find who can see the world with fresh eyes — and thoughts — is welcomed. Throughout the amiable pages of The News: A User’s Manual one is forced to concede that philosopher de Botton has a fundamental grasp not just on how the news is made and delivered but also what underlying presumptions and agendas are being fed to us. Most of us are happy enough eating the sausage without ever seeing how it is made. A good example: During the 1980’s missing children stories garnered huge news coverage in the United States. Thousands upon thousands of children, it was reported, were going missing every year. (Famously, their pictures plastered on milk cartons in an effort to find them.) With each round of stories the numbers grew; child welfare agencies inflated the numbers, eager news outlets gobbled them up, and the public devoured every lurid report. The runaway news spiral continued until the Denver Post blew the whistle — only a few hundred children went missing, mostly in custody disputes — for which it won the Pulitzer Prize for meritorious public service. That de Botton can scold us so thoroughly and slap us on the wrist for our slack news-reading habits is testament to his good-natured charm. He makes taking bad medicine seem rather delightful. Consider this gem: “News stories tend to frame issues in such a way as to reduce our will or even capacity to imagine them in profoundly other ways.” The Devil is not in the details, it’s in the very architecture, the structure of the news we are fed and consume each day. Amidst that cacophony he observes that “we would at key moments be wise to forgo hysterical annoyance for deep and quiet melancholy.” That is, turn off the news and turn on our introspection. Anyone seeking to make sense of our emerging (and in-our-face) Anthropocene world will face of constant barrage of conflicting, agenda-laden news, sometimes well-intentioned but flawed, sometimes outright snake oil masquerading as facts and truth. The News: A User’s Manual can help provide insightful guidance.